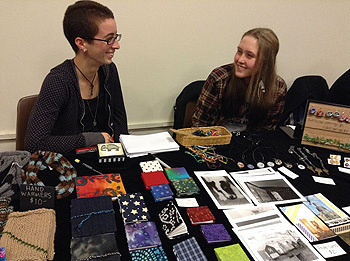 Eighteen years ago, homeschooling parent Claudia Teachman teamed up with KidsPLAYce Director Tim Ellis and organized the very first Kid's Craft Fair in Brattleboro, Vermont. The event encouraged children to to work with their hands, learn project management skills, put mathematics to use, and explore their creative self-expression. 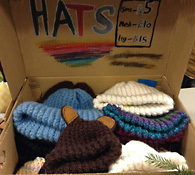 For many children, this became one of their first experiences of earning money through their own creativity. The children and the event flourished. 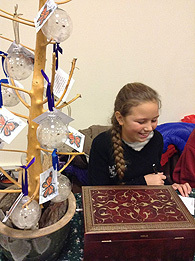 Children sold handmade beeswax candles, holiday cards, cider mulling mix, and jewelry, and bought equally valuable and creative items like wooden knitting needles, polymer clay creations, lambswool roving fairies, and baked goods. One favorite memory from that first fair was hearing Tim blow the whistle marking that the fair had entered its final half-hour. At that moment, a new magic entered the space as unmet desires were fulfilled through the art of bartering. Kids traveled around the fair negotiating this for that and going home feeling enriched by each other's creative spark. Teachman shared, "What I got out of organizing the event for so many years was the fullfillment that in addition to all that children learned by participating in the fair, they were having a firsthand experience of seeing that there are other options than simply going to work for somebody else in order to survive in the world." With homeschooling families passing the organizational baton over the years, the tradition continues featuring crafts from children regardless of where they go to school (or not) this Friday, December 4, from 5 to 8 p.m. at The River Garden. The 18th Annual Children's Holiday Craft Fair will feature the following items: Muffin Mix, Wrapping Paper, Handmade Cards, Herbal Dream Pillows, Candles, Ornaments, Wooden Toys, T-Shirts, Patches, Figurines, Lip Balm, Jewelry, Herb-Infused Vinegars, Farm-Raised Lamb and Eggs, On-Site Face Painting, Pastel Portraits, Dream Catchers, Knitted Clothing, Sachet Pillows, and Origami. And, if you are strolling through downtown and want just a little sweet something, you'll find a variety of regular and gluten-free cookies, bars, brownies, muffins, ginger bread, popcorn and desserts. All proceeds from the Bake Sale help defray costs involved with the event. For more info, email marcellaeversole@gmail.com.